If you’re looking to book a romantic break for two with a difference, then look no further! Our Tree Pods Heavens Above! 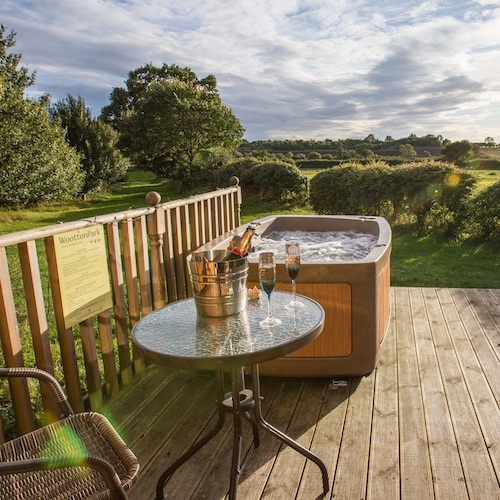 & Over the Moon and Mega Pods Pegasus & Andromeda, have a private hot tub on the decking and magnificent countryside views. Sip champagne under the stars in a hot tub and listen to the wind in the trees. 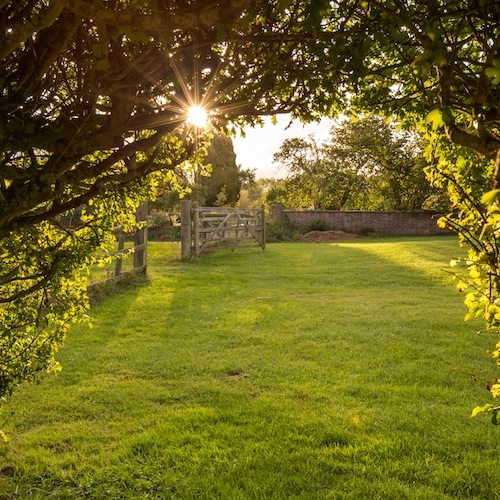 Watch the sunset together and experience the magic of waking up to the dawn chorus. Clean rooms and extremely polite and helpful staff. We stayed in the house for our wedding night which was amazing and then a pod the night after which was just so relaxing! Had a wonderful two night stay celebrating our marriage at Wootton Park, everything and we mean everything was amazing!! 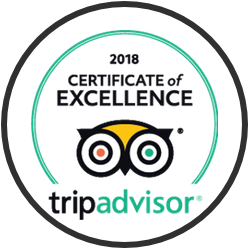 Your staff are extremely helpful and friendly, the grounds and views are breathtaking! My partner and I stayed in the megapod with our own hot tub and we absolutely loved it! It was peaceful and felt like we were the only people staying there. The accommodation provides everything you need for a relaxing short break. We were there celebrating our 20th wedding anniversary and the balloons and wine provided in the room was a nice touch and made us feel very special. We loved it and will stay again. We love everything romantic at Wootton Park – for romantic occasions such as proposals, anniversaries or weddings, please let us know and we can arrange a heart of petals on your bed. 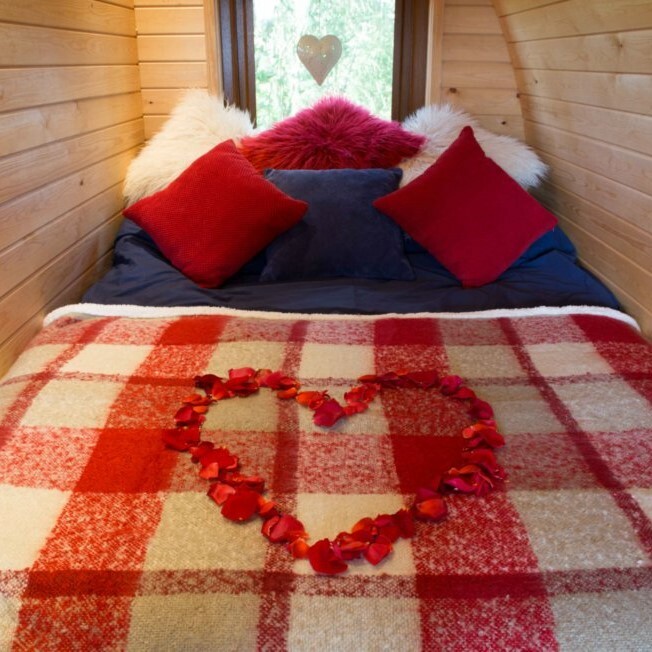 Our little group of Glamping Pods set amongst the trees are cosy with a double bed, bedding, towels and bathrobes. The shower and WC Pod is just steps away and there’s also a BBQ, fire pit, hot tub and outside seating area. 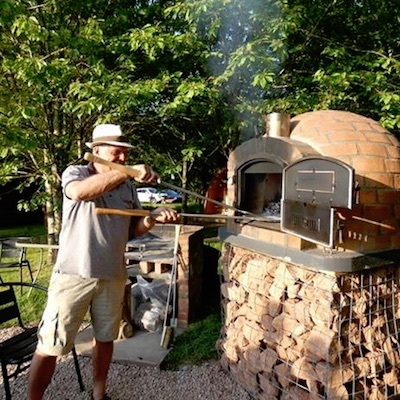 We have a new Pizza Oven and you can book a slot to bake your pizza outdoors. For a small fee, bring your dough & ingredients and we will supply the wood and prepare the oven for use. We travelled from approx. an hour away to get to Wootton Park to arrive at an area of peace and beauty. 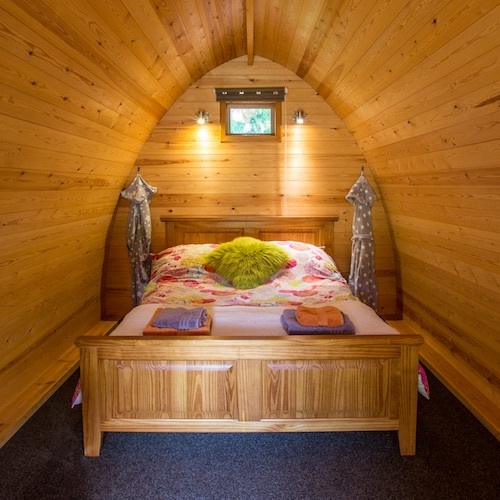 The pod was well equipped, cutely decorated and absolutely spotless. We went on the trip for our son’s third birthday and the entire time he said this is the best birthday ever! Just wanted to say thank you again for a wonderful time on Saturday night. The bride to be had a wonderful time, as we all did. What fun we had chatting and making pizzas. The pizza oven is just fab. We will be back next year I sure. By the sounds of it we may have to book out all the pods due to the amount of people that saw our pictures and want to come. Many thanks again! 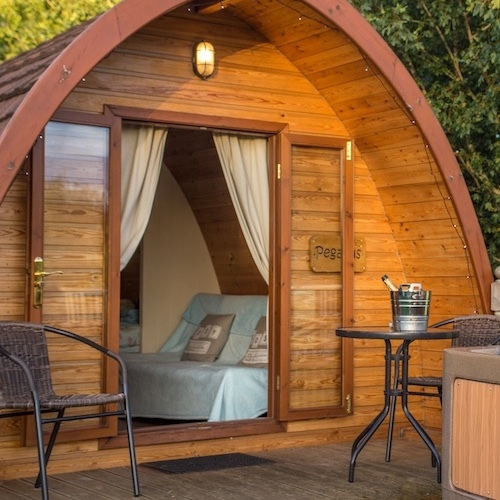 Our little group of GlampingPods (Mistral, Sirocco, Meltemi and Zephyr) are set amongst the trees with exclusive use of one large hot tub nearby for your party with fabulous views up to the hills. Full English breakfast is included. If there are more than 8 of you, you can also book the 2 MegaPods (Pegasus and Andromeda) and 2 TreePods (Heavens Above! and Over the Moon) which also sleep 2 people per Pod and have their own private hot tubs and ensuite and kitchenette. Celebrate together under the stars . . . Need to get away from the fast pace of modern life and relax? Our Tree Pods Heavens Above! & Over the Moon and Mega Pods Pegasus & Andromeda, have a private hot tub on the decking and magnificent views. 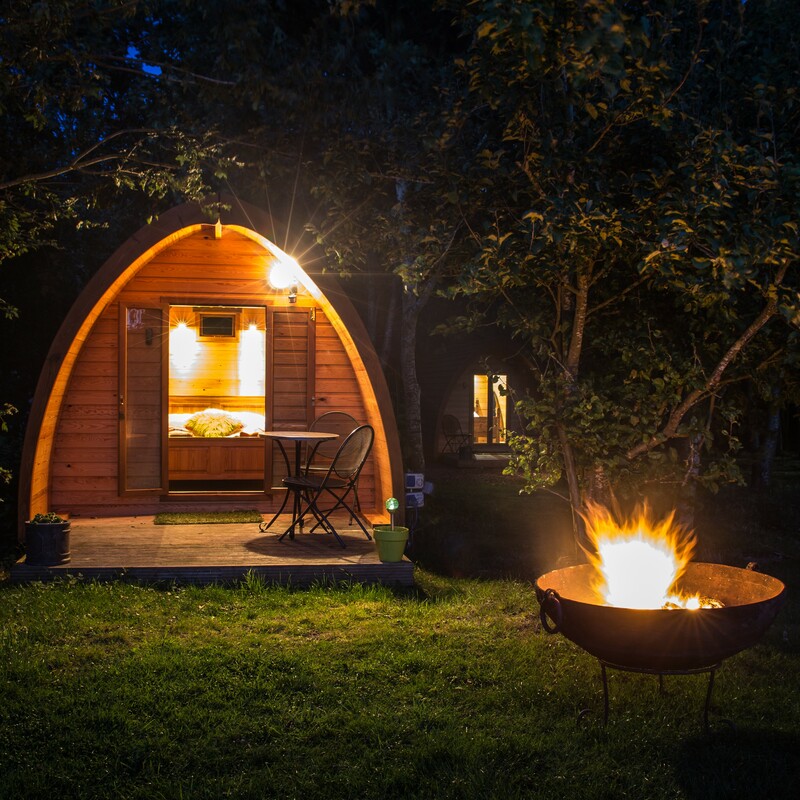 Different to your standard hotel room, you’ll be in luxury and cosy right next to nature too. 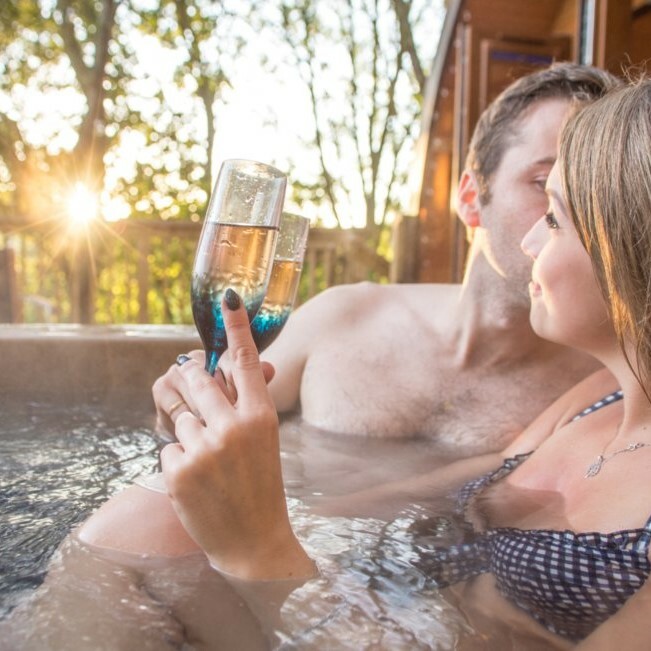 Sip champagne under the stars in a hot tub and listen to the wind in the trees. 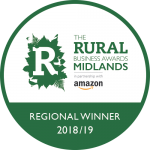 It’s the perfect place to unwind and immerse yourself in the sights and sounds of the countryside. Amazing tree pod! It was very homely, spotlessly clean, and idyllic. With the added bonus of our very own private hot tub. Amazing!! Will definately return for some more chill time. Friendly staff with great hospitality! Lots of animals to see, the miniture ponies were the cutest! Lovely views from the decking and very peaceful environment! The hot tub was lovely and clean, with a wonderful atmosphere at night! The pod was spotless and well designed and was equipped for everything you needed. It had excellent and quick wifi as well as towels and robes for the hot tub. I really could not fault this place, we loved it and we can not wait to go back. You can bring your meals already prepared and warm something up in the microwave while you are here, or cook on the BBQ. Or if you prefer, you can eat out in nearby Henley in Arden, or even order a take away to be delivered to your Pod!